The ‘beastly stuff’ was first performed in the Leipzig Gewandhaus on 15 December 1910. Frieda Kwast-Hodapp was the soloist and Arthur Nikisch conducted. Reger was delighted with the performance, nicknaming the soloist ‘Kwast-Hutab’ (‘Kwast-Hats off’) in honour of her playing. The critics, however, hated it. Paul Bekker—a champion of Mahler and Schoenberg—was withering, though rather contradictory. On the one hand, Bekker deplored ‘this kaleidoscope-like jumble of ideas that have no real beginning, no recognizable conclusion, no organic coherence’, and on the other, charged Reger with using ‘slavishly exact copies of old forms’ that had been transformed into ‘unnaturally distended monstrous growths […] the products of a personality who lacks the capacity for organic construction’. If anything, the judgement of Walter Niemann was even more negative: ‘The F minor Concerto presents no particular difficulty to those pianists familiar with Brahms and Liszt, and who possess developed full-chord and register-transfer skills. The work is halfway inventive only in the first movement and for the rest is simply schematic and Max-imally irritating. Thus I must openly acknowledge that the work seemed to me to be the latest miscarriage of the Reger muse as she sinks deeper and deeper into inbreeding.’ Reger was hurt by the hostile press reception of the Piano Concerto—it was a critical assault that literally drove him to drink and by the following year he was seen turning up to concerts blind drunk. His health quickly declined, leading to his death (from a heart attack) in 1916, when he was just forty-three. In February 1912 Reger wrote to Georg, Duke of Saxe-Meiningen: ‘My Piano Concerto is going to be misunderstood for years. The musical language is too austere and too serious; it is, so to speak, a pendant to Brahms’s D minor Piano Concerto. The public will need some time to get used to it.’ Reger was still bitter about the critics: ‘It’s really very funny that the German critics yet again are baffled when faced with my Piano Concerto, since all three movements are written in strict classical forms, and in the Largo the chorale ‘Wenn ich einmal soll scheiden’ appears note-for-note as the principal melody—and none of those donkeys noticed.’ Walter Frisch writes that Reger was ‘proud of his Piano Concerto, claiming that in it he had “found a path that is more likely to lead to a goal than all the other new paths”’, and Reger’s own estimation of the work makes his irritation with the critics all the more understandable. Its subsequent history is more encouraging: the young Rudolf Serkin gave a highly praised performance in Vienna with Furtwängler and the Wiener Tonkünstler Orchestra in January 1922, and when Serkin and Mitropoulos gave the US premiere in Minneapolis on 16 November 1945, the reception was so enthusiastic that the finale had to be encored. Some resistance remained, even from the Reger pupil George Szell. When Serkin suggested they should perform the Concerto, Szell replied that he couldn’t ‘stomach it’; Serkin was ‘surprised, disappointed and hurt’ by Szell’s reaction. In Frieda Kwast-Hodapp, Reger had a swashbuckling and fearless soloist, and the piano writing in the concerto reflects this, conceived for a consummate virtuoso. 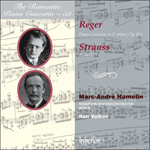 The instrument is treated with a sheer flamboyance that sets this work apart from some of Reger’s solo piano music. Despite his dislike of the work, Walter Niemann’s review (quoted above) identified the two dominant influences—Brahms and Liszt—on the sonority and layout of the piano part. The influence of Brahms is clear. What Charles Rosen called ‘the inspiration of awkwardness’ in Brahms’s piano style is also evident in Reger’s concerto. It makes huge technical demands on the soloist while avoiding the temptation to dazzle for the sake of it. As well as some daunting passages in octaves, the soloist has to negotiate some elaborate figurations in the inner parts, and some thoroughly Brahmsian leaps and cross-rhythms. This apparent ‘awkwardness’ is for strictly musical ends—partly to integrate the solo part into the musical argument rather than to dominate it, and partly to draw some unusually rich colours from the keyboard. But other passages recall the kind of kaleidoscopic textures that can be found in Liszt’s B minor Sonata—from massive chords to passages of glittering delicacy ranging across the whole compass of the piano. Reger draws on the examples of these earlier masters to fashion an individual manner of writing for the soloist that requires a grand display of keyboard prowess while never compromising the fundamental seriousness of the musical argument. The slow movement, Largo con gran espressione, begins with a piano soliloquy. Hermann Unger described this movement as ‘an ever-blossoming melody’, and a ‘transfiguration scene’. But what is being transfigured? Reger claimed that he used a chorale tune ‘note-for-note as the principal melody’ (the most famous of the Passion chorales, ‘Wenn ich einmal soll scheiden’—‘O Haupt voll Blut und Wunden’; its first four notes are clearly heard on the oboe and first violins a few minutes in). Reger draws on two other chorales: ‘O Welt, ich muss dich lassen’ (used in both the St Matthew and St John Passions) steals in at the first hushed entry of the strings, and at the end of the movement a fragment of ‘Vom Himmel hoch’ is heard on the oboe. Yet Reger never sounds like pastiche; he employs these chorale fragments as part of a richly original and beautiful fabric. The finale, marked Allegretto con spirito, is a stormy piano-orchestra dialogue that eventually resolves into an exciting dash to an affirmative conclusion in F major. Le «sale truc» a été créé au Gewandhaus de Leipzig, le 15 décembre 1910, par Frieda Kwast-Hodapp sous la direction d’Arthur Nikisch. Enchanté de l’exécution, Reger a surnommé la soliste «Kwast-Hutab» («Kwast-Chapeau bas») en l’honneur de son jeu. Néanmoins, la critique a détesté cette œuvre. Paul Bekker—champion de Mahler et de Schoenberg—a été cinglant, mais assez contradictoire. D’une part, Bekker a déploré «ce fouillis kaléidoscopique d’idées sans véritable commencement, ni conclusion reconnaissable, ni cohérence organique»; de l’autre, il a accusé Reger d’utiliser «des copies servilement exactes de formes anciennes» transformées en «grosseurs monstrueuses anormalement distendues […] les produits d’une personnalité qui manque de la capacité de construction organique». Le jugement de Walter Niemann a été encore plus négatif: «Le Concerto en fa mineur ne présente pas de difficulté particulière aux pianistes qui connaissent bien Brahms et Liszt, et qui possèdent des aptitudes pour les accords complets développés et les transferts de registre. L’œuvre est à moitié inventive seulement dans le premier mouvement et, pour le reste, elle est simplement schématique et Max-imalement irritante. Ainsi, je dois franchement reconnaître que cette œuvre m’a semblé être la dernière grave erreur de la muse de Reger car elle plonge de plus en plus profondément dans la consanguinité.» Reger a été blessé par la réception hostile que la presse a réservé à son Concerto pour piano—c’est un assaut critique qui l’a littéralement conduit à boire et, l’année suivante, on l’a vu aller au concert ivre mort. Sa santé a rapidement décliné et il est mort (d’une crise cardiaque) en 1916, à l’âge de quarante-trois ans seulement. En février 1912, Reger a écrit à Georg, duc de Saxe-Meiningen: «Mon Concerto pour piano sera mal compris pendant des années. Le langage musical en est trop austère et trop sérieux; c’est, pour ainsi dire, un pendant du Concerto pour piano en ré mineur de Brahms. Il faudra du temps au public pour s’y habituer.» Reger était encore amer à propos des critiques: «Il est vraiment bizarre que les critiques allemands soient encore perplexes lorsqu’ils sont confrontés à mon Concerto pour piano, car les trois mouvements sont tous écrits dans des formes classiques strictes et, dans le Largo, le choral «Wenn ich einmal soll scheiden» apparaît note pour note comme la mélodie principale—mais aucun de ces ânes ne l’a remarqué.» Walter Frisch écrit que Reger était «fier de son Concerto pour piano, affirmant que dans cette œuvre il avait «trouvé une voie ayant davantage de chances de mener à un objectif que toutes les autres voies nouvelles»», et, comme Reger estimait beaucoup cette œuvre, son irritation envers les critiques est d’autant plus compréhensible. La suite de son histoire est plus encourageante: le jeune Rudolf Serkin en a donné une exécution couronnée de succès à Vienne avec Furtwängler et le Wiener Tonkünstler Orchester en janvier 1922, et lorsque Serkin et Mitropoulos ont donné la première exécution américaine à Minneapolis, le 16 novembre 1945, l’accueil qui lui a été réservé a été si enthousiaste que le finale a dû être bissé. Quelques-uns ont encore résisté, notamment l’élève de Reger, George Szell. Lorsque Serkin a suggéré qu’ils jouent le concerto, Szell a répondu qu’il ne pouvait «le supporter»; Serkin a été «surpris, déçu et blessé» par la réaction de Szell. En la personne de Frieda Kwast-Hodapp, Reger a eu une soliste truculente et intrépide, ce que reflète l’écriture pianistique du concerto, conçu pour une virtuose consommée; l’instrument est traité avec une extravagance pure qui place cette œuvre à l’écart de certaines musiques pour piano seul de Reger. Même s’il n’a pas aimé cette œuvre, Walter Niemann, dans sa critique citée ci-dessus, a identifié les deux influences dominantes—Brahms et Liszt—sur la sonorité et l’agencement de la partie de piano. L’influence de Brahms est manifeste. Ce que Charles Rosen a appelé «l’inspiration de la maladresse» dans le style pianistique de Brahms est également évident dans le concerto de Reger. Il impose d’énormes exigences techniques au soliste tout en évitant la tentation d’éblouir pour éblouir. Outre certains passages décourageants en octaves, le soliste doit négocier des figurations élaborées dans les parties internes, ainsi que des sauts et des superpositions rythmiques brahmsiens. Cette «maladresse» apparente a un objectif strictement musical—intégrer la partie soliste dans l’argument musical au lieu de le dominer, tout en tirant du clavier des couleurs d’une richesse inhabituelle. Mais d’autres passages rappellent le genre de textures kaléidoscopiques que l’on peut trouver dans la Sonate en si mineur de Liszt—des accords massifs aux passages d’une délicatesse scintillante sur toute l’étendue du piano. Reger s’inspire des exemples de ces maîtres antérieurs pour façonner une manière d’écriture pour le soliste qui lui est propre et qui requiert un grand étalage de prouesses pianistiques sans jamais compromettre le sérieux fondamental de l’argument musical. Le début de l’Allegro moderato (avec un roulement de timbales et un rythme qui rappellent le début du Concerto en ré mineur de Brahms) montre Reger à son niveau harmonique le plus avancé, avec une tendance délibérée à éviter la tonalité de base (fa mineur). Comme le modèle de Brahms, le premier mouvement est de loin le plus long des trois. Après une courte introduction orchestrale, le piano jaillit en octaves fortissimo. L’interaction dramatique très développée entre le soliste et l’orchestre (l’écriture pianistique est souvent ouvertement brahmsienne) fait penser à la description de Reger par Tovey, le «rhétoricien parfait». Le second thème radieux (marqué molto tranquillo) est du Reger le plus remarquablement lyrique. Le mouvement lent, Largo con gran espressione, commence par un soliloque du piano. Hermann Unger a décrit ce mouvement comme «une mélodie de plus en plus épanouie» et une «scène de transfiguration». Mais qu’est-ce qui est transfiguré? Reger a affirmé qu’il avait utilisé un choral «note pour note comme mélodie principale» (le très célèbre choral de la Passion, «Wenn ich einmal soll scheiden»—«O Haupt voll Blut und Wunden»; on entend clairement ses quatre premières notes au hautbois et aux premiers violons après quelques minutes. Reger s’inspire de deux autres chorals: «O Welt, ich muss dich lassen» (utilisé dans la Passion selon saint Matthieu comme dans la Passion selon saint Jean) apparaît à la première entrée feutrée des cordes et, à la fin du mouvement, on entend un fragment de «Vom Himmel hoch» au hautbois. Pourtant, la musique de Reger ne ressemble jamais à un pastiche; il utilise ces fragments de choral comme une partie d’une structure richement originale et magnifique. Le finale, marqué Allegretto con spirito, est un dialogue houleux entre le piano et l’orchestre qui se résout finalement dans une course folle et excitante vers une conclusion affirmative en fa majeur. Das „Schweinszeug“ wurde erstmals am 15. Dezember 1910 im Leipziger Gewandhaus aufgeführt. Frieda Kwast-Hodapp war die Solistin und Arthur Nikisch der Dirigent. Reger war von der Aufführung begeistert und nannte die Solistin „Kwast-Hutab“. Die Kritiker jedoch konnten gar nichts mit dem Werk anfangen. Paul Bekker—ein Fürsprecher Mahlers und Schönbergs—äußerte sich in vernichtender, wenn auch widersprüchlicher Weise. Einerseits missbilligte er „dasselbe kaleidoskopartige Durcheinanderschütteln der Gedanken, die keinen richtigen Anfang, keinen erkennbaren Schluß, keinen organischen Zusammenhang haben“, andererseits warf er Reger vor, „sklavisch treue Kopien alter Muster“ verwendet zu haben, die dann zu „unnatürlich gewachsene[n] aufgedunsene[n] Monstrositäten … Erzeugnisse[n] einer Persönlichkeit, der die Fähigkeit, organisch zu gliedern fehlt“ geworden seien. Walter Niemann äußerte sich sogar noch schärfer: „So muß ich denn offen bekennen, daß mir das nur im ersten Satz halbwegs erfundene, im übrigen schematisch er-Regerte, Brahms- und Liszt-Vertraute Klavierspielende mit entwickelter Vollgriff- und Wurftechnik vor keine sonderlichen Schwierigkeiten stellende F-moll Konzert als eine neue Fehlgeburt der in Inzucht verkommenden Reger-Muse erschienen ist!“ Reger verletzte diese feindselige Reaktion der Presse auf sein Klavierkonzert sehr—dieser Angriff trieb ihn buchstäblich zum Alkohol und im darauffolgenden Jahr wurde er volltrunken bei Konzerten gesehen. Sein gesundheitlicher Zustand verschlechterte sich zusehends und führte 1916 zu seinem Tod (er erlag einem Herzanfall) im Alter von nur 43 Jahren. Im Februar 1912 schrieb Reger an Herzog Georg II. von Sachsen-Meiningen: „Mein Klavierconcert wird für Jahre noch unverstanden bleiben; die Tonsprache ist zu herb und zu ernst; es ist sozusagen das Pendant zum Brahms’schen D-moll-Klavierconcert; da muss sich das Publikum erst daran gewöhnen.“ Über die Kritiken war er noch nicht hinweggekommen: „Sehr spaßhaft ist es, wenn die deutsche Kritik wieder mal ratlos meinem Klavierconcert gegenüber steht; daß alle drei Sätze in streng klassischer Form geschrieben sind, daß im Largo der Choral ‚Wenn ich einmal soll scheiden‘ Note für Note als Hauptmelodie da ist, das merkt keiner von den Eseln.“ Walter Frisch schreibt, dass Reger stolz auf sein Klavierkonzert gewesen sei und erklärt habe, dass er damit einen Weg gefunden habe, der eher zum Ziel führen würde als alle anderen neuen Wege. Regers eigene Einschätzung des Werks macht seine Verärgerung über die Kritiker umso verständlicher. Die weitere Entwicklung des Klavierkonzerts ist ermutigender: der junge Rudolf Serkin gab eine vielgelobte Aufführung des Werks in Wien im Januar 1922 zusammen mit Furtwängler und dem Wiener Tonkünstler-Orchester, und als Serkin und Mitropoulos am 16. November 1945 die US-Premiere in Minneapolis gaben, wurde das Werk derartig begeistert aufgenommen, dass das Finale noch einmal als Zugabe gegeben werden musste. Ein gewisser Widerstand erhielt sich jedoch, sogar von dem Reger-Schüler George Szell. Als Serkin ihm vorschlug, das Konzert mit ihm aufzuführen, gab Szell zurück, dass er das „nicht ertragen“ könne; Serkin war über Szells Reaktion „überrascht, enttäuscht und verletzt“. In Frieda Kwast-Hodapp hatte Reger eine verwegene und unerschrockene Solistin, was auch in dem hochvirtuosen Klavierpart des Konzerts deutlich wird. Das Instrument wird mit einer Extravaganz behandelt, die in vielen Werken für Soloklavier von Reger nicht anzutreffen ist. Obwohl er das Werk nicht mochte, identifizierte Walter Niemann in seiner Rezension (s.o.) die beiden wichtigsten Einflüsse—Brahms und Liszt—in Bezug auf das Klangbild und die Anlage des Klavierparts. Der Einfluss von Brahms ist deutlich. Was Charles Rosen als „die Inspiration der Ungeschicklichkeit“ in Brahms’ Klavierstil bezeichnete, tritt auch in Regers Konzert in Erscheinung. Für den Solisten ist es technisch sehr anspruchsvoll, doch wird das Brillieren um der Brillanz willen vermieden. Neben einigen gewaltigen Passagen in Oktaven muss der Solist komplexe Figurationen in den Mittelstimmen sowie einige von Brahms inspirierte Sprünge und Polyrhythmen bewältigen. Diese offenbare „Ungeschicklichkeit“ dient rein musikalischen Zwecken—einerseits um den Solopart in das musikalische Geflecht einzubinden, anstatt es zu dominieren, und andererseits um dem Klavier einige ungewöhnlich reichhaltige Klangfarben zu entlocken. In anderen Passagen kommen jedoch so kaleidoskopische Texturen zum Vorschein, wie sie in Liszts h-Moll Sonate auftreten—von massiven Akkorden bis zu Passagen glitzernder Feingliedrigkeit, die den gesamten Umfang des Klaviers abdecken. Reger greift auf die Techniken der älteren Meister zurück, um einen individuellen Stil für den Solisten zu formen, bei dem einerseits pianistisches Können zur Schau gestellt, andererseits jedoch die fundamentale Ernsthaftigkeit des musikalischen Inhalts nie beeinträchtigt wird. Der Beginn des Allegro moderato (mit einem Paukenwirbel und einem Rhythmus, die beide an den Beginn des d-Moll Konzerts von Brahms erinnern) ist in harmonischer Hinsicht die fortgeschrittenste Passage Regers, wobei er absichtlich die Grundtonart (f-Moll) vermeidet. Ebenso wie bei Brahms’ Konzert ist der erste Satz mit Abstand der längste der drei Sätze. Nach einer kurzen Orchester-Einleitung bricht das Klavier mit Fortissimo-Oktaven hervor. Das hochentwickelte, dramatische Wechselspiel zwischen Solist und Orchester (der Klavierpart hat oft deutlich Brahms’sche Züge) verdeutlicht Toveys Charakterisierung Regers als „großartigen Rhetoriker“. Das strahlende zweite Thema (mit molto tranquillo markiert) zeigt Reger in besonders lyrischer Stimmung. Der langsame Satz, Largo con gran espressione, beginnt mit einem Monolog des Klaviers. Hermann Unger beschrieb diesen Satz als „eine immer weiter aufblühende Melodie“ und als eine „Verklärungsszene“. Was wird jedoch verklärt? Reger hatte behauptet, eine Choralmelodie „Note für Note als Hauptmelodie“ verwendet zu haben (den berühmtesten der Passions-Choräle, „Wenn ich einmal soll scheiden“—„O Haupt voll Blut und Wunden“; die ersten vier Töne sind nach ein paar Minuten deutlich in der Oboe und den ersten Violinen zu hören). Reger bezieht sich auf noch zwei weitere Choräle: „O Welt, ich muss dich lassen“ (der sowohl in der Matthäus- als auch in der Johannes-Passion vorkommt) schleicht sich bei dem ersten gedämpften Einsatz der Streicher ein, und am Ende des Satzes ist ein Fragment aus „Vom Himmel hoch“ in der Oboe zu hören. Trotzdem klingt Reger nie wie ein Pasticcio; er verarbeitet diese Choralfragmente als Teil eines originellen, reichhaltigen und wunderschönen musikalischen Stoffes. Das Finale, mit Allegretto con spirito überschrieben, ist ein stürmischer Dialog zwischen Klavier und Orchester, der schließlich mit einem spannenden Spurt zu einem positiven Schluss in F-Dur endet.